Waterhousehold is an important parameter in biogas production. Both low and high humidity can cause inhibition of methanogenesis. 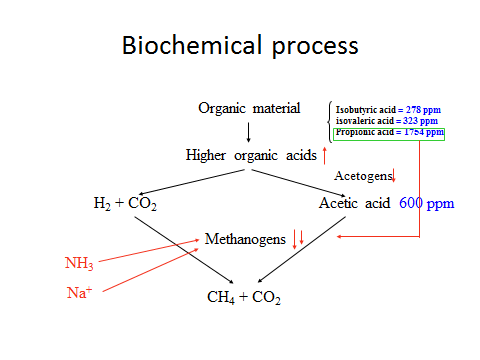 Above example shows the inhibition of biogas production due to toxic effects of ammonium and salts, leading to reduced methane production from acetic acid and accumulation of higher organic acids in the leachate. Especially propionic acid accumulation can then form a secondary inhibition on the biogas production.